2. Plant new seed (don’t plant saved seed). 3. A fungicide seed treatment is recommended for winter wheat in WI. 4. Wheat should be planted 1 inch deep. 5. The target seeding rate for wheat planted from September 15th to October 1st is 1,300,000 to 1,500,000 seeds per acre. 6. The optimal seeding rate for wheat planted after October 1st should be incrementally increased as planting date is delayed to compensate for reduced fall tillering. 8. Drought considerations: Check herbicide labels for plant back restrictions and conduct a PPNT for wheat following any corn crop. As with any crop, variety selection is the most important factor to consider in maximizing winter wheat yield and profitability. When choosing a winter wheat variety, several factors must be considered. These include winter survival, insect and disease resistance, lodging, test weight, and most importantly, yield. Since no variety is ideal for every location, it is important to understand the crop environment and pest complex that affects your specific region to maximize yield. Yield is based on the genetic potential and environmental conditions in which the crop is grown. Therefore, by diversifying the genetic pool that is planted, a grower can hedge against crop failure. Select those varieties that perform well not only in your area but across experimental sites and years. This will increase the likelihood that, given next year’s environment (which you cannot control), the variety you selected will perform well. Test weight is also an important factor to consider when selecting a variety. The minimum test weight to be considered a U.S. #2 soft red winter wheat is 58 lb/bu. Wheat at lower test weights will be discounted. Both environment and pests may greatly affect test weight; therefore, selecting a variety that has a high test weight potential in your region is critical to maximizing economic gain. Select a variety that has the specific insect and disease resistance characteristics that fits your needs. By selecting varieties with the appropriate level of resistance, crop yield loss may be either reduced or avoided without the need of pesticides. Careful management of resistant cultivars through crop and variety rotation, are required to ensure that these characteristics are not lost. Crop height and lodging potential are also important varietal characteristics that may be affected by your cropping system. If the wheat crop is intended for grain only, it may be important to select a variety that is short in stature and has a low potential for lodging. This may decrease yield loss due to crop spoilage and harvest loss as well as increase harvesting rate. However, if the wheat crop is to be used as silage or is to be harvested as both grain and straw, then selecting a taller variety may be warranted. For detailed information regarding winter wheat variety performance please visit www.coolbean.info for results of the 2012 WI Winter Wheat Performance Test. To maximize wheat yields in 2013, it is imperative that growers plant certified or private (professionally prepared) seed that is true to variety, clean, and has a high germination percentage (>85%). If growers absolutely need to plant saved seed due to availability or other economic considerations, the following steps should be taken to increase the likelihood of establishing a legal and good wheat crop. Step One: Determine if you can legally plant the wheat seed you saved. Today, many private wheat varieties now come with statements which buyers sign at the time of purchase, stating that they understand they are not authorized to use the harvested grain for seed. Most current public winter wheat varieties are Plant Variety Protected (PVP) and though you may replant them on your own land, you do not have the right to trade/sell seed of those varieties to others for planting. Step Two: Once you have determined if you can legally plant the seed you saved, the next step is to clean the wheat seed. It is important that wheat seed be cleaned to remove small and damaged seeds and to eliminate weed seeds. Removing small and damaged seeds will not only aid in crop establishment, but will also provide a more uniform wheat seedling stand. Removing small and damaged seeds will also increase the thousand-kernel weight (TKW), which serves as a measure of seed quality. Wheat seed with TKW values greater than 30 grams tend to have increased fall tiller number and seedling vigor. lot and conduct at least 4 – 100 seed counts. If germination is below 85%, it is important to increase the seeding rate to compensate; however, we would caution growers from seeding any wheat with a germination test below 80%. Step Four: Assess the need for a seed treatment. A number of fungicides and insecticides are labeled for use as seed treatments on winter wheat and are listed in Pest Management for Wisconsin Field Crops 2012 (UW-Extension A3646). Seed treatment fungicides protect germinating seed and young seedlings from seedborne and soilborne pathogens. Seed treatment fungicides will not improve germination of seed that has been injured by environmental factors and will not resurrect dead seed. Remember, seed treatment fungicides applied this fall will not protect against potential FHB infection next summer. If seed with scab must be used for planting, a seed treatment fungicide is a must. Wheat should be planted ~1.0 inch deep depending upon soil moisture conditions. Wheat planted less than 0.5 inches deep may result in uneven germination due to seed exposure or dry soil conditions. Shallow planted wheat is also more susceptible to soil heaving. Wheat planted more than 1.5 inches deep may result in death due to pre-mature leaf opening or poor tiller development and winter survival. Uniform seed placement and seeding depth are important in promoting crop health in the fall. The targeted fall stand for wheat planted from September 15th to October 1st is between 30 and 35 plants per square foot. To achieve this goal, the seeding rate for soft red winter wheat is between 1,300,000 and 1,600,000 viable seeds per acre (Table 1). Depending upon varietal seed size, this equates to a range of between 74 and 119 pounds of seed per acre (Table 2). 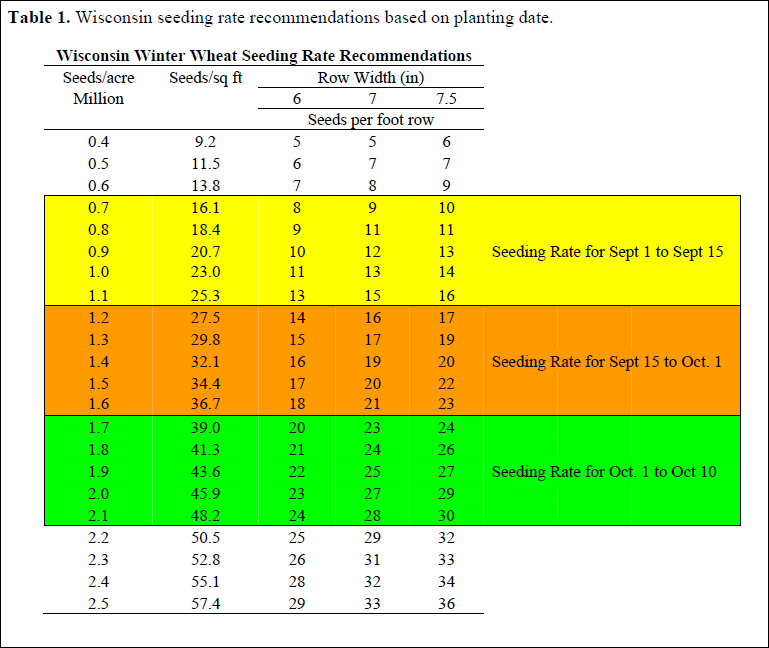 The optimal seeding rate for wheat planted after October 1st should be incrementally increased as planting date is delayed to compensate for reduced fall tillering (Table 1). The Wisconsin winter wheat final planting date varies by county, ranging from September 30th to October 10th. If the wheat is seeded after the county’s final plant date (late planting period) the crop insurance guarantee is reduced by 1% per day for the first 10 days. If wheat is seeded after the late planting period, the crop insurance guarantee is reduced to 60% of the original guarantee. The Trend Adjustment option is now available for some Wisconsin counties on Wheat. Talk to your crop insurance agent for more details. Winter wheat coverage is not available in all Wisconsin counties. Air seeded (flown on by airplane) wheat is not insurable and no premium is charged. There is a 200% maximum difference between the Base and Harvest Prices with no downside limit. Yield data from our long term rotation experiment located at Arlington, WI indicated that wheat grain yield was greatest when following soybean (Table 3) (Lauer and Gaska, 2003-2006, unpublished). Yield of second year wheat (2003 column) was similar to wheat yields following corn for grain or silage. Third (2004), fourth (2005), and fifth (2006) year continuous wheat yields were dramatically lower than the other rotational systems. Our data suggests that growers should plant wheat after soybean first, then corn silage, corn for grain, and lastly wheat. If growers choose to plant second year wheat, several management factors should be considered to reduce risk. First plant a different wheat variety in the second year that possesses excellent resistance to residue-borne diseases. Under no circumstances should growers consider planting bin-run seed in second year wheat. By planting a different variety with strong disease resistance characteristics you can reduce the likelihood of early disease pressure and significant yield loss. Growers should use a seed treatment in wheat following wheat. Be aware that seed treatments are not a cure all for all common diseases in continuous wheat systems (e.g. take-all). Growers should also consider increasing their seeding rate to 1.8 to 2.0 million seeds per acre in wheat following wheat systems. This will aid in stand establishment and increase the likelihood of a uniform stand going into the winter. Lastly, if using a notill system, planting into a seedbed that is free of living volunteer wheat is important in reducing the incidence of Barley Yellow Dwarf Virus. Growers should consider a herbicide application to any living volunteer wheat prior to planting to prevent a “green bridge” for the aphids that vector this virus. powdery mildew and lodging that may decrease yield, grain quality and slow harvest.